meaning I will earn a small commission if you click through and make a purchase. 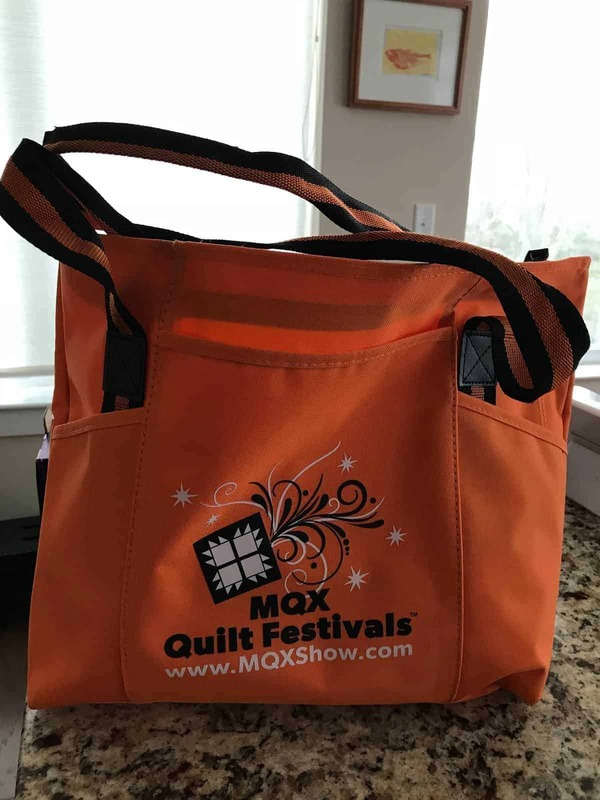 I was so excited to get to MQX after many years of not attending any major shows. I always try to get to the local ones, and this is an hour away, but raising a young man can take up your time. It seems that the local ones either collided with an event or were on the heels of something else so I didn’t go. I so enjoyed this year’s show. The quilts are phenomenal. I will show you one that I loved. 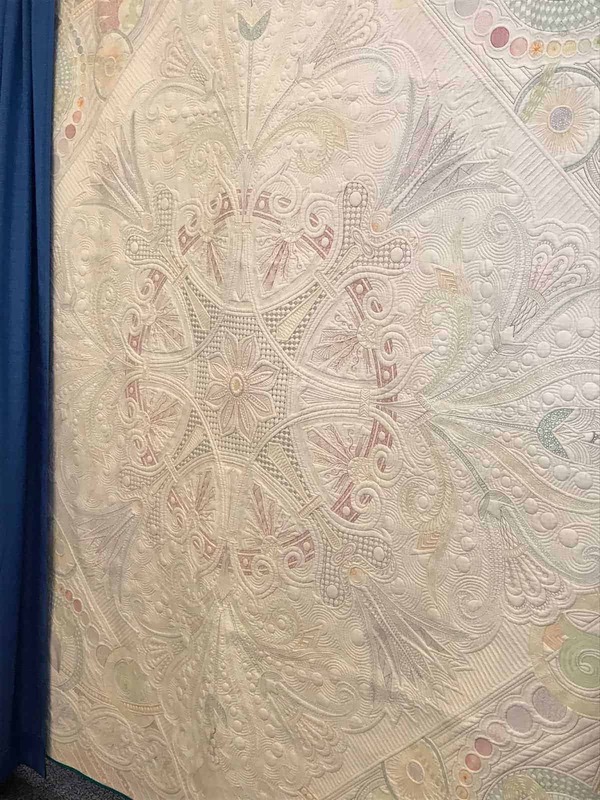 I loved the composition of this quilt and the quilting on it. One of the hardest things in attending this show is not letting yourself get discouraged by the talent of others. 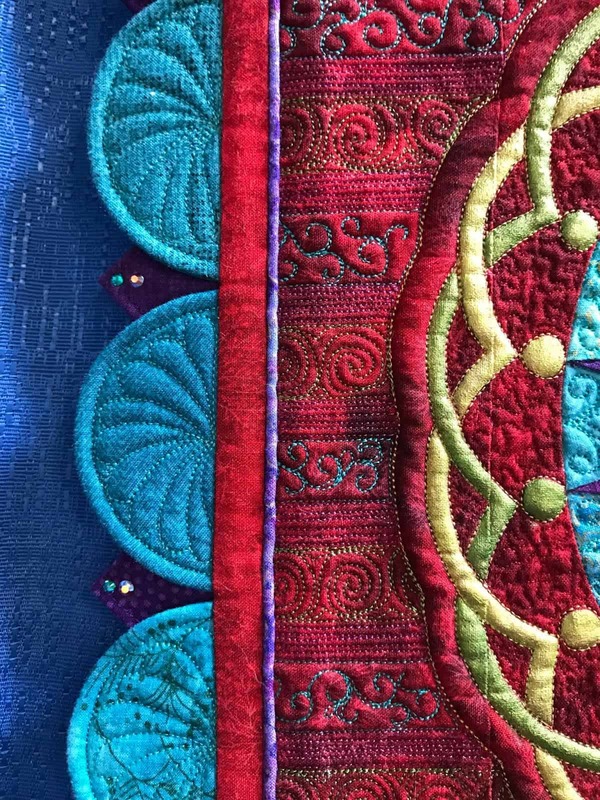 I sometimes walk away feeling so inadequate in my quilting. I have to remind myself that this is the best of the best and my goal was to learn some things while I was there. 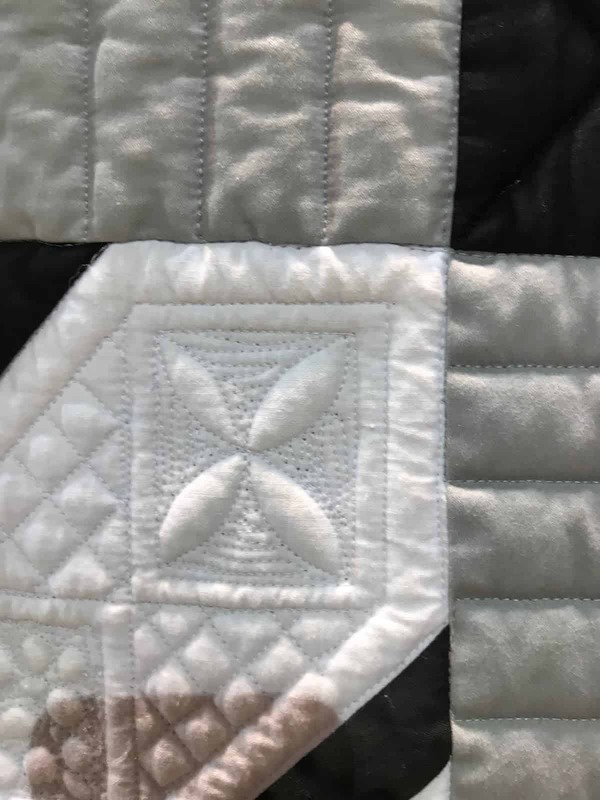 One thing I struggle with is a way to remind myself of quilting designs. I have thought of drawing them but that does not always work. I am now thinking of a smart photo album on my computer. I love some of the details in this pictures and wanted to remember easy ways of filling some space – divide and conquer is a good thing to call these samples. The above pictures were to remind me of things that I admire but will probably never do. I love the detail, but I doubt I am ever doing to do any of these techniques. The picture on the right was the back of a quilt. 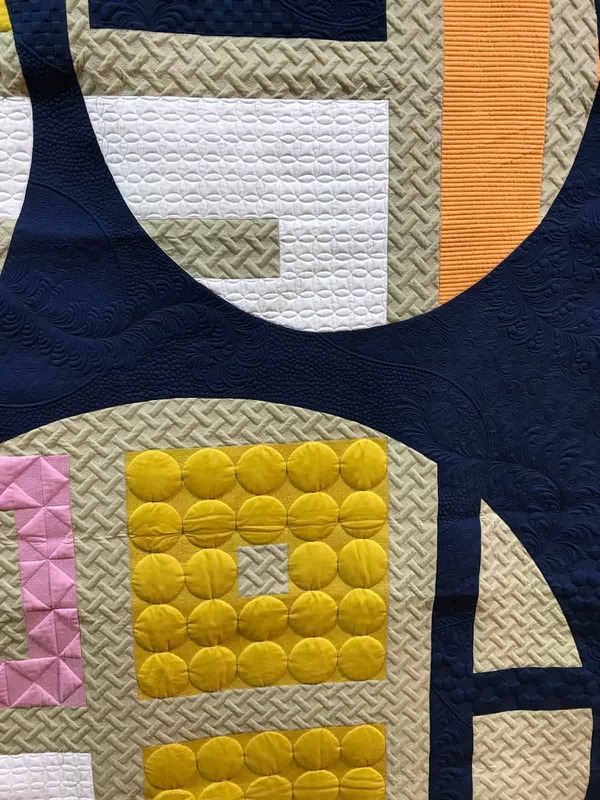 The thread colors make it a whole cloth quilt – I love that! Maybe a smaller, less complicated version is in the works for me, but I would definitely have to remember to use a white backing, something I rarely do. I took a workshop with Candace West, Digital Design Wall in EQ8*. It was a terrific class and gave me the confidence to do more of what I need in the design package. I love software programs that work, and this one does. It is fairly complicated, but also easy. The instructor was calm and efficient in a class with more students than she expected and some students had an older version of EQ – a little tricky. I knew a fair amount but learned quite a bit and I also have some videos/files from the class (the handout on a flash drive) that will allow me to review and learn more! I didn’t buy a longarm or midarm (what I really want) but I did get a few things. 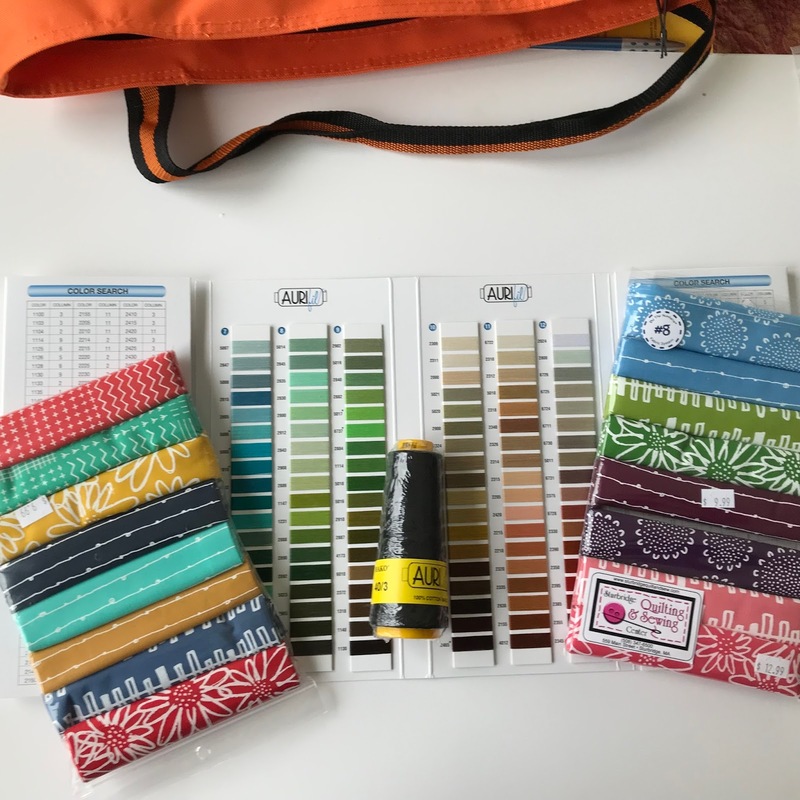 [*indicates affiliate link – for those who want to share in the fun and/or help support my blog] I chose Aurifil black for my giveaway since I have a huge cone of Aurifil white. I purchased a thread card as it is really helpful to have one when you want to know what it available. 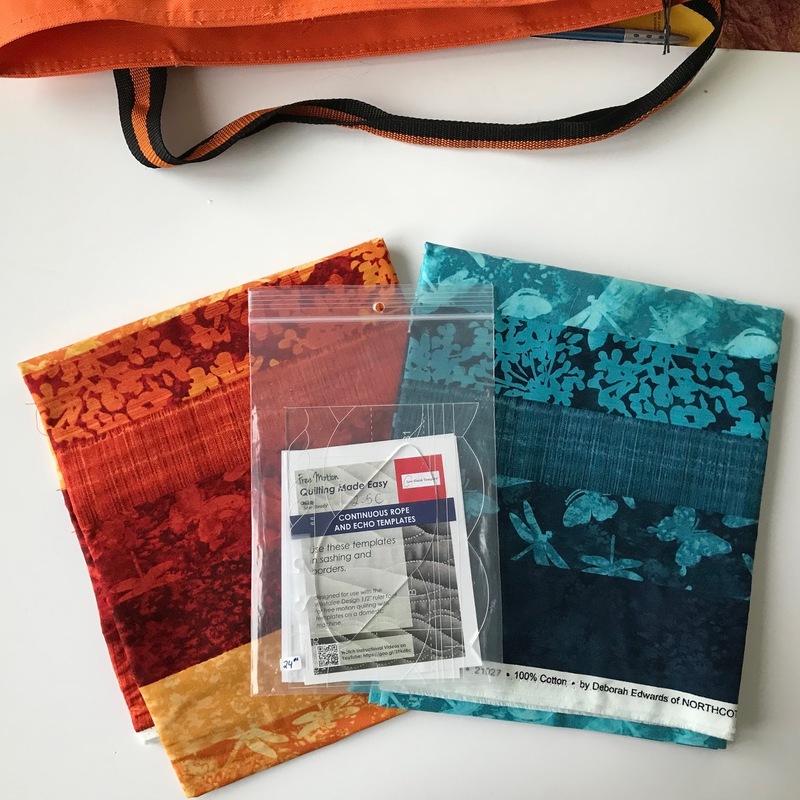 The “8 packs” of fabric are fat eighths for a QAL with Sandra at mmm!quilts, beginning April 28. Before machine quilting became hugely popular and accepted, many of my quilting projects used template stencils. 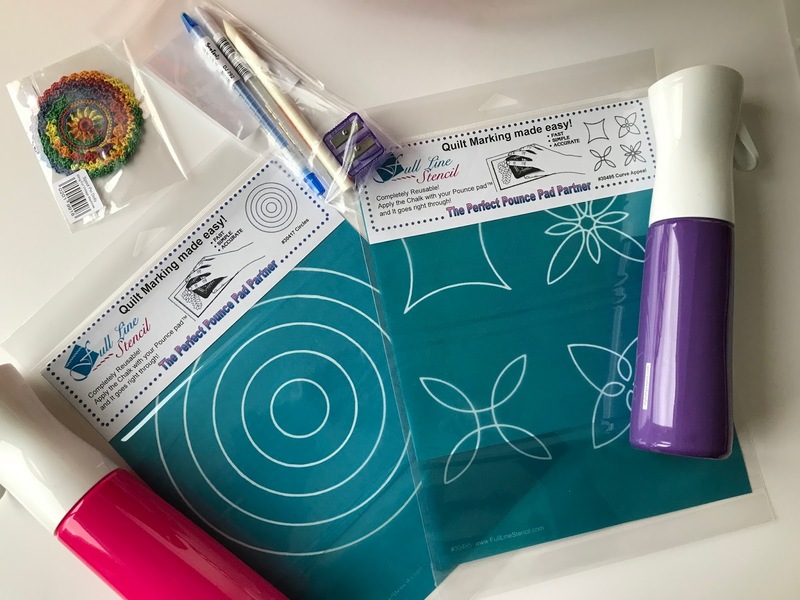 These stencils are used with the Pounce *, and recently I was thinking of a few ideas and loved these for some projects I am working on. The pink/purple containers are a fine mist spray bottle*. Mine don’t work very well and the one for my starch drives me nuts. I’ll let you know what I think. I also bought an Ultimate Chalk Pencil* and Sharpener, I love marking tools. 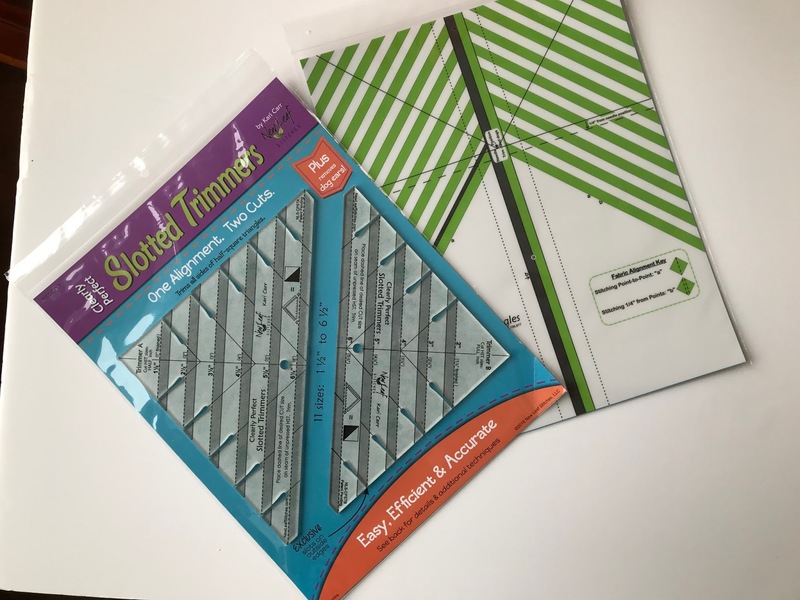 This ruler is for trimming the half square triangle, the Clearly Perfect Slotted Trimmer*. A Carpenter Star project I did recently would have been much faster with both of these tools. I like ruler as you trim before pressing and the side slots allow you to trim the nasty dog ears off. The other is the Clearly Perfect Angles*. I had a tool like this before, but this one can be repositioned and is slightly tacky – I look forward to reporting more on these. And last, but not least for purchases are these 3 items. The fabric is for a pattern I have, which calls for a cheater stripe and I hope this will work. The pattern didn’t make the trip so I don’t if its right. However, his is my favorite color combination right now, so what could be wrong if it doesn’t? The last is a ruler for my Westalee set, that now adds a Rope Border to my repetoire. The other great thing about shows is meeting old and new friends. The above quilt is one of the Island Batik Ambassadors, Suzy Webster, for the Dot Challenge. It was fun to see it and even more fun was meeting another ambassador, Jennifer Strausser. So much fun to meet her and talk about our experiences. We first became acquainted in the 2017 NewQuiltBlogger group and now are ambassadors together. I look forward to meeting more of my ambassador or quilt blogger friends at other shows in the future. Well, now to use some of these tools! meaning I will earn a commission if you click through and make a purchase. You are welcome! I will send you a them in a bit! Wow I love the quilting on the quilt with the orange and pink circles. The tan background looks like a steel grid floor. It is beautiful. Let me know how you like your Clearly Perfect Angles. I have one, just haven't put it on my machine yet. I will let you know, but everyone that I know loves it! A little pricey but think how many of those pesky triangles are in our lives. Wow you sure had fun. Thanks for sharing and explaining your purchases. I love stuff like that. I also go to shows and take photos of the quilting so I can build an "idea book" that helps me when I need to quilt something. Such fun meeting other Ambassadors! I'd love to do that someday. Thanks for sharing on Wednesday Wait Loss. Indeed it was a lot of fun. I think it was more of a Wait Gain Wednesday for me! 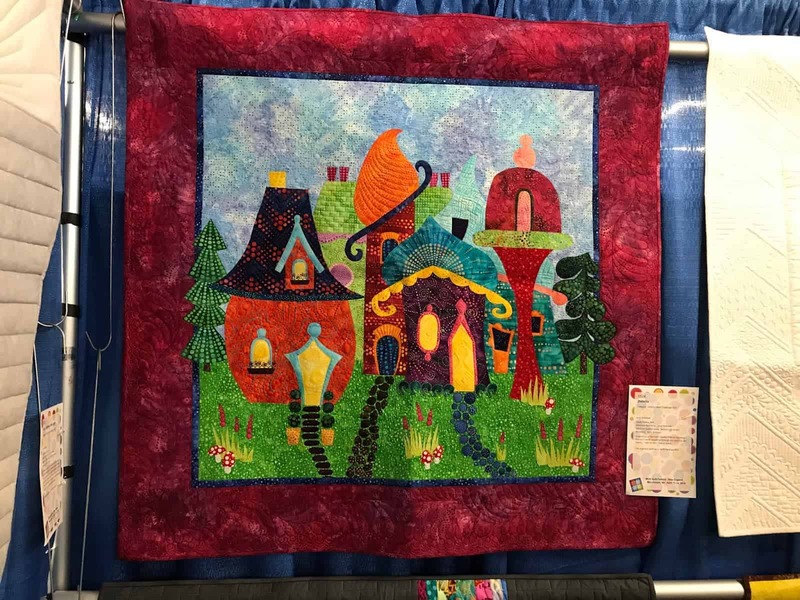 I am committing to Quilt Con next year (in Nashville) – a few others I know from 2017NQBloggers are thinking of it. Keep it in mind! 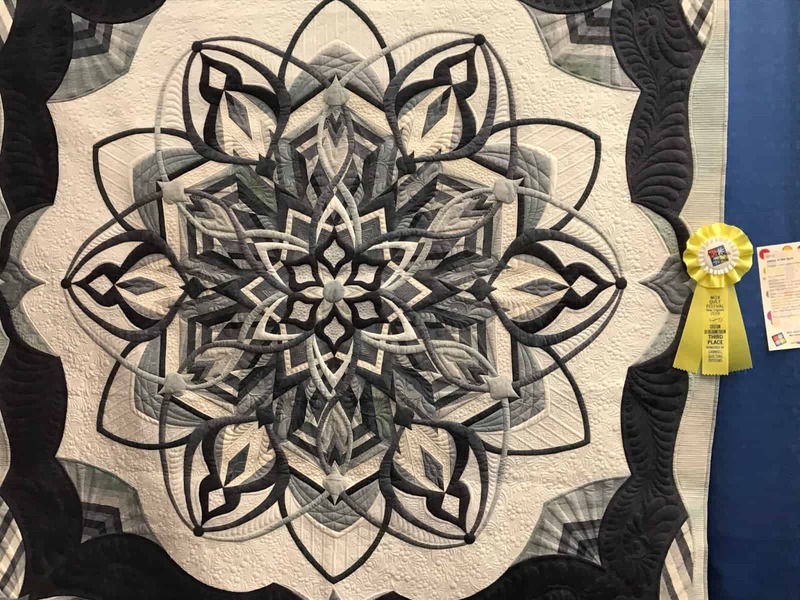 Looks like you had a great quilt show trip! 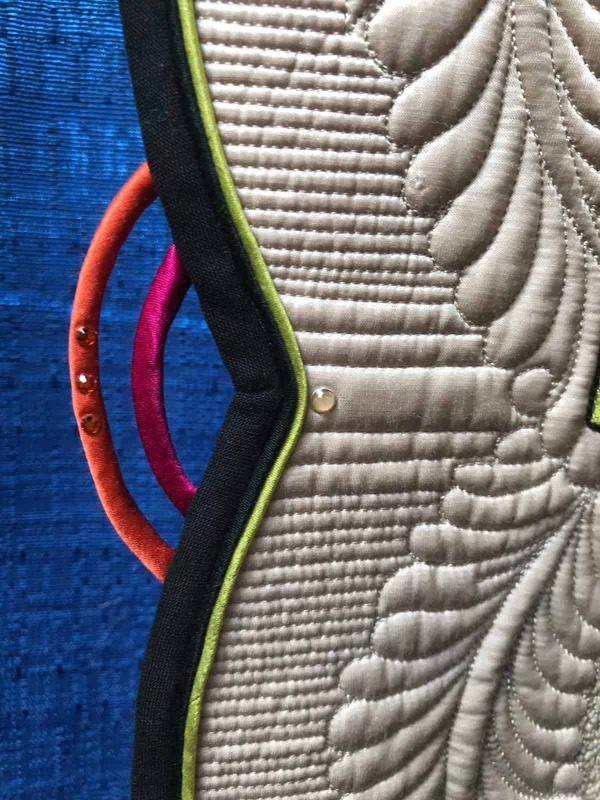 I can relate about feeling inadequate upon seeing all those perfect, detailed quilts. We have to do what is fun for us. 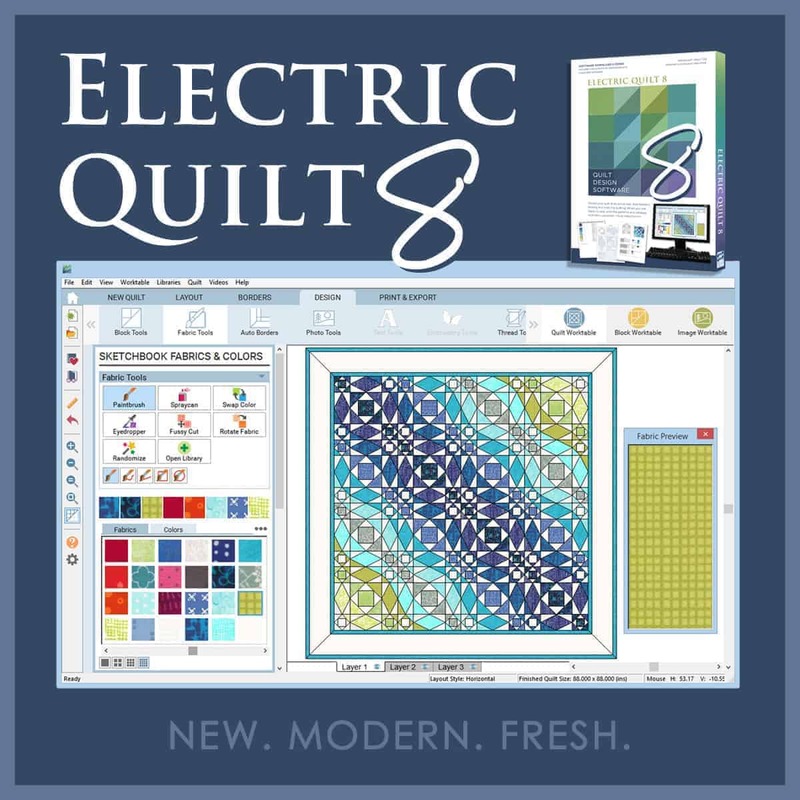 And you got a lot of neat purchases that will surely be a means to having quilt fun! Thanks, Nancy. It was really fun and fun to meet friends from the blogosphere! Oh what fun! I think I would've been happy just with the bag, because I love the orange color! I tend to get discouraged too, but I'm trying to change my way of thinking and reminding myself that those quilters were where I am once. They didn't just wake up one day and make that fabulous stuff. Let me know how that marker pen works! I love the bag, too. I will let you know how that pen works, love to have options! 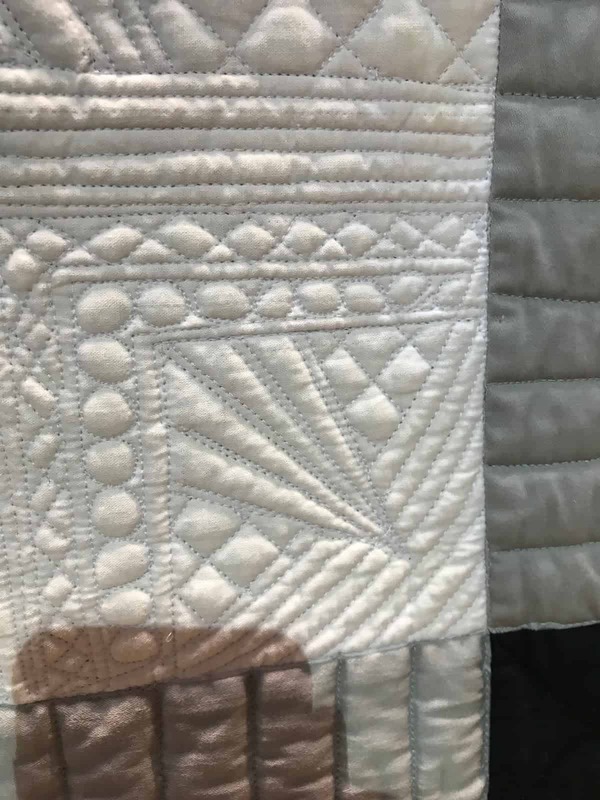 What fun and I enjoyed the detail of the quilting that you showed us. It is always fun meeting our blogging friends and ambassadors. It was good for me to have some reminders of things I may want to do some day. I am still fretting over how to collect them. Wow what amazing quilts you have shown!! I have only just heard about MQX and hope, one day, to get over to it – it sounds and looks fantastic! 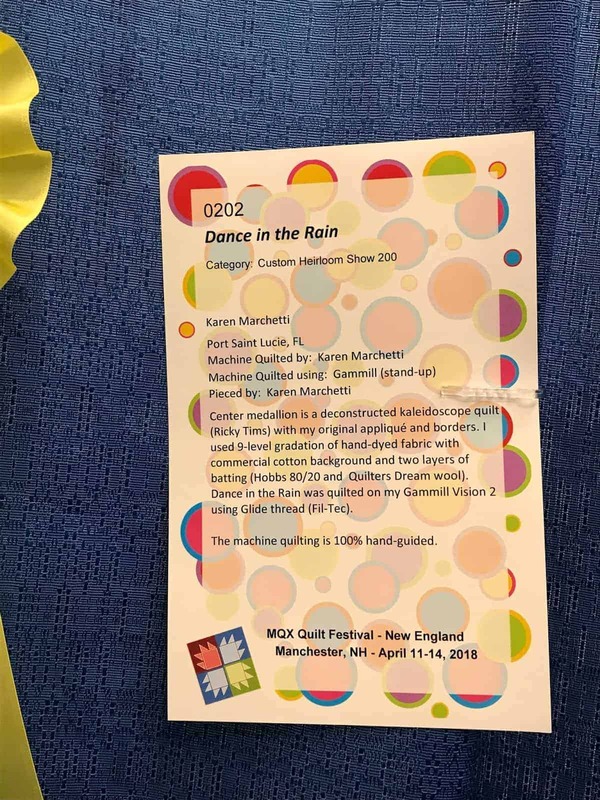 It is a great show and really impressive machine quilting! So over the top on many of them, but they are the best of the best. Looks like a great show and I like the goodies you purchased. Thanks, Cheryl. It is always good t find a few new things – I try to be very careful and only get what really makes sense. I did pretty well this time.